Urban Archeologist: A Toast to all who skip the mall, visit the Flea, and buy what they see. A Toast to all who skip the mall, visit the Flea, and buy what they see. I think the idea of tag sale'ing is closely related to the origins of man. It really is a continuation of the hunter gatherer instinct. Sale'ing is not a year 'round thing, it has its seasons. Spring brings a cleaning and clearing sort of sale, Summer brings everybody with everything kind of sale, Fall seems to cause people to reflect and so you get more attic clearing sales. Winter is hibernation and holiday time, the sales here are few and far between. During the winter months I like to pour over my top finds and research the unanswered questions each presents. 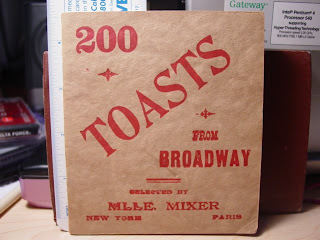 The booklet "200 Toasts from Broadway" was a "fix" I needed this past weekend. I found it at a Ridgefield estate sale and it worked for me only because of its contents and age (1907). The copyright is by Mixer Doty and lists New York and Buffalo as origins. Truly a bar side companion, but I can find nothing more from my research. Any ideas? And Heaven when you die.